Celebrating the grand opening of Belk with some of the most influential people in Dallas, and fashion friends, was an affair to remember. The North Carolina-based company revealed its massive flagship store at the Galleria Dallas earlier this spring after much anticipation from the Dallas community. Belk and Galleria Dallas pulled out all the stops to welcome guests with some Southern [and glamorous] hospitality at the Opening Gala on April 3. Tickets were $50 and all proceeds went to Susan G. Komen, one of the charities that Belk supports. Belk was the place for star sightings that night. Actress and Belk brand ambassador Hayden Panettiere opened the runway show with a Q&A. In case you were wondering, she's even more petite in person than she is on TV. I really need to start watching ABC's Nashville because I hear it's amazing. Moreover, she seemed like a nice girl with a cool personality. What I enjoy about Belk is that it's unlike any other department store in Dallas. Although they showcase a deep offering of preppy merchandise, Belk still manages to offer a product breadth that appeals to pretty much everyone. Plus, I appreciate their frequent sales and promotions so you can get the most bang for your buck. Nelli Tokleh, thank you for inviting me to this phenomenal event. I had such a fun time, and so did my friend Stephanie Koh. 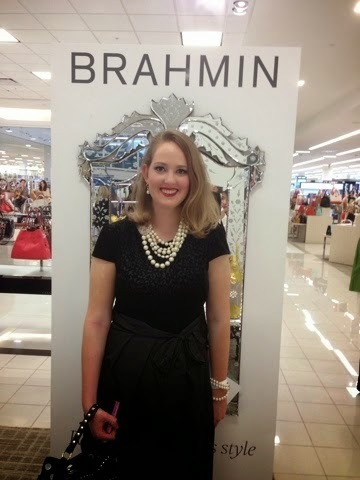 She recently started a blog called Dollie Gal, so check out her post about the Belk extravaganza! Southern. Modern. Style. Does it get more Dallas than that? Welcome to Dallas Galleria Belk! you are in a great spot.. This looks like an amazing event. Sorry to have missed it. Have been to Belk since the opening and love the way it is laid out. It's very light, airy and easy to find merchandise that you are looking for. The sales staff is so friendly.. Great Merchandise and love the summer colors and how they are displayed !